In last week’s column, we started looking at how to make a basic spreadsheet to do repetitive EV calculations for us so that we don’t have to do them by hand over and over again. This week, we’re going to look at the homework for last week and some tricks on how to add multiple betting options. The reason for this is that we’re going to change up how we calculate out opponent’s calling frequency. Since the folding frequency and the calling frequency have to always add up to 100 percent (or just 1 in the case of the spreadsheet), we’re going to change things around so that the calling frequency is automatically updated when we put in the value for the folding frequency. The way we’re going to do that is by replacing cell D4 in the above with “=1-B4” without the quotes. 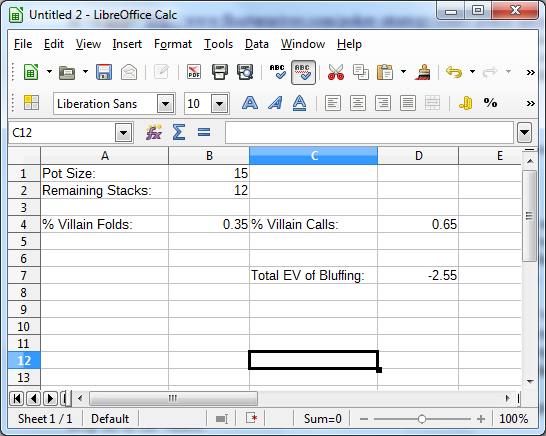 This will automatically subtract the one by the value in B4 (the folding frequency) to calculate the calling frequency. Now you can put in a different value for the folding frequency, say 0.5 for 50 percent as an example, and as soon as you hit enter, the calling frequency will update itself. You’ll notice that there are now two columns of data. The arrangement that I suggest for the spreadsheet is to keep all of the values that you will need to input in the left-hand column while all of the values that are automatically calculated should stay in the right-hand column. This will save you trouble from here on out so that you don’t accidentally write over a formula and have to spend a bunch of time trying to figure out why your spreadsheet will not update itself. For last week’s homework, I suggested that you try on your own to set up the spreadsheet to calculate the EV of checking. The point of this is that we have to compare the EV of checking to the EV of bluffing to know which is greater in this particular scenario. 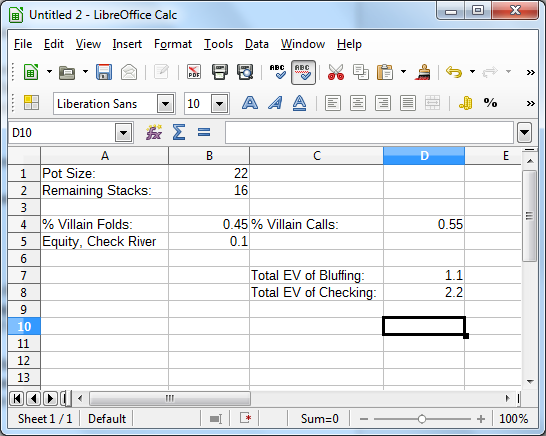 It’s possible to have a situation where the EV of bluffing is positive but with the EV of checking being higher. With everything in place now, we can start to look at different scenarios and analyze checking behind on the river in the general sense. Now let’s use our spreadsheet to look at a different situation that’s very specific. Suppose the pot is $22 and we have $16 behind. We break down our opponent’s ranges and decide that he’ll fold about 45 percent if we bluff, and we’ll have about 10 percent equity if we check back. Should we bluff? In fact, the EV of checking in this particular scenario would be twice that of bluffing even though bluffing itself is profitable. Poker is all about figuring out which of your options is the best. From an analytical standpoint, if you could figure out which of your options has the highest EV, then that would give you some insight on which individual play is better in a vacuum. Using spreadsheets like these help you to do just that, and by studying specific scenarios in depth, you can develop a feel for how they work. It’s this feel that allows you to play better on a more consistent basis while you’re at the tables. Your homework for next week is as follows. We’re going to be heads-up on the turn in position considering a semi-bluff all-in. To evaluate the EV of the semi-bluff itself, you’ll need to know the size of the pot, the size of the remaining stacks, the chance Villain folds and our equity if Villain calls. Next week, we’re going to look at the answer to this homework, and we’re going to start working out what the EV of checking would look like in that particular scenario. 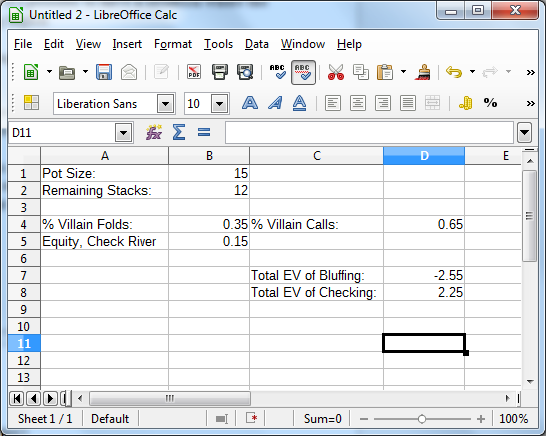 Hints for the Homework: Remember to organize your spreadsheet into two columns. The left column should be the information that you’re going to actually input, and the right column should be the information that is automatically calculated.